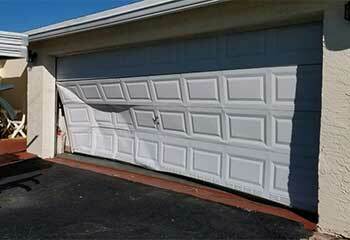 Below you can find examples of the latest garage door projects our technicians were able to complete successfully. We always put a hundred and ten percent effort into any task we're asked to perform, and you can always count on us when you need any type of professional assistance. 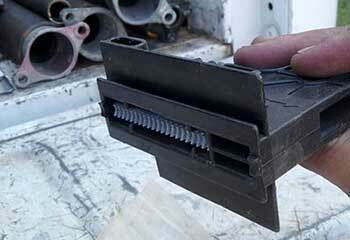 Customer Issue: The customer’s opener made louder and louder noises during operation, and began to slow down. Our Solution: As the source of the noises was clearly inside the opener box, our team unplugged it and looked inside the casing. They found a bent spindle in the motor, and replaced it and several adjacent components that had been scratched, which solved the problem. 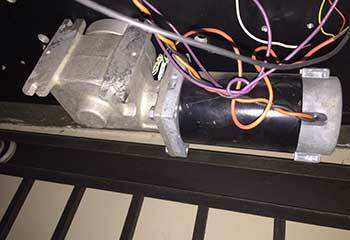 Our Solution: We arrived at this customer's house and immediately noticed the damage. We then proceeded to remove the affected panels and installed new matching ones in their place. The customer was very happy with our work. 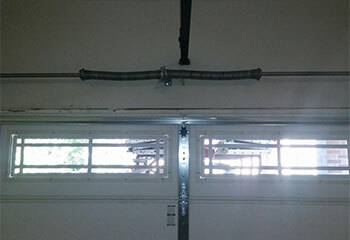 Our Solution: This customer's torsion spring broke off and rendered her door inoperable. We quickly removed the leftover parts and installed a new oil tempered spring in its place which will last for much longer thanks to its enhanced durability. We then adjusted the new spring and made sure the door was fully operational again. Customer Issue: Door gets stuck halfway. Our Solution: After making a thorough assessment of this customer's system, we discovered the problem to be with both a pair of worn out rollers and a track clogged with debris. After replacing the damaged components and clearing the track we made sure the door was able to fully open easily.